Pages: 266 + xiv pp. Patrick Dunn’s first book, Postmodern Magic: The Art of Magic in the Information Age (Llewellyn Publications, 2005), was a treat, and honestly one of the best books on magic the present reviewer has yet encountered. In its introductory chapters, it presents four models of magic — magic as spirit-based, magic as energy-based, magic as psychologically-based, and (most innovatively) magic as information-based — which is the model employed for the remainder of the book. This is an approach that appeals to the present reviewer greatly, and would also find great resonance among the fans of the writings of Alan Moore, Taylor Ellwood, Erynn Rowan Laurie (and Irish filidecht practice), and all of those who are Hermetic (which is to say, Hermes-affiliated), word- and poetry-related in their magical approaches. Given the merits and successes of his first book, I greatly anticipated digging into the present volume. I was not disappointed. While reading Dunn’s first book would be useful and much recommended, it is not utterly necessary to do so in order to easily understand what Dunn outlines in this latest volume. After the Acknowledgments and a brief Introduction, there are ten substantive chapters (each around twenty pages), four appendices, a glossary, a bibliography, and a fairly comprehensive index. Linguistic theory and semiotics infuse the entire excursus, and individual chapters cover such topics as magical alphabets, poetry, primal languages, gematria, mantras, and narrative. One of the best chapters of the book is Chapter Two, “Language: The Bridge of Mind and Matter.” This chapter argues that the physiological component of spoken language (which requires an explanation of phonology, and how individual consonant and vowel sounds are produced — which Dunn handles very skillfully and accessibly) bridges the immaterial world of thought with the material world, in which most magic ultimately has its effect. Sound creates vibration, and is produced through the movement of matter (in the form of exhaled breath) over other forms of matter (the anatomy of the human upper respiratory system, oral and nasal cavities). This adds up to something which, unfortunately, is often lost in the understanding of many modern pagans and magicians: namely, that speech, chanting, and other forms of verbal performance are bodily in nature, and not insubstantial or ethereal in their essence. To produce words, whether in writing or in speech, requires bodies and bodily action. In many respects, this obvious fact that is so often taken for granted acts, at least in the opinion of the present reviewer, as a clarion call to realizing the power of words in written and oral magical work, but further to realizing how embodied and physical the use of such things actually is within magical and spiritual practice. Anyone who thinks verbal prayer and singing is not a deeply physical (and sensual) practice simply doesn’t understand how much coordination and concentration these actions in fact involve. The performative nature of language and utterance in general society is emphasized (particularly in Chapter Three), and for those not used to considering words in these terms, provides an exciting opportunity to re-think one’s linguistic usage generally. One of the further excellent aspects of this book is the wry humor that is found throughout it. Linguists are a very quirky and geeky bunch by nature, and yet, their humor is often inaccessible to those who are “non-initiates”; but the same is not true of Dunn’s humor. He often uses footnotes for these comical asides — as they are meant to be used! — and some of them include comments on not drawing any odd looks if one were to do the Greater Invoking Ritual of the Pentegram on the El-trains in Chicago (p. 124n96), the use of a Graeco-Egyptian magical formula with diet soda not quite having the same poetic ring to it (p. 53n37), the possibilities of Goethe’s aphorisms (p. 84n67), and the clever quip “In science, experiments are always public with occasional personal application. In magic, experiments are always personal with occasional public appreciation” (p. 12n13). This type of linguistic humor and word play infuses the writing, and adds to one’s enjoyment of it considerably. In his chapter on glossolalia (speaking in tongues) and “barbarous words” in magical usage — historically, culturally, and in modern practice — Dunn details the procedure undergone by a modern Christian practitioner of speaking in tongues, and how it can be adapted for usage by pagans. His citation of this practice is done with the utmost respect for the practice and the tradition from which it originates, and is accompanied by a sensitive and insightful discussion of cultural appropriation and its excesses. This is an exemplary approach to take, and is highly appreciated. There is a portion of Dunn’s excursus on esoteric associations with vowel sounds that he has innovated himself (p. 42), which the present reviewer found to be extremely useful: “for me, /i/ feels aggressive, /e/ feels communicative, /a/ feels creative, /o/ feels defensive, and /u/ feels sensual, at least at the moment.” The identification of these associations as the author’s own experience and opinion on the matter is definitely of great utility, and indeed, more esoteric, magical, and pagan authors do need to claim their own innovations and ideas as their own, rather than attributing them to some hoary and ancient tradition. But, in this particular case, the brief sharing of his own experiences amidst the wider discussion proved to be extremely useful and applicable in this reviewer’s own work, and was one of many tidbits in the work that will prove useful in future practice. Other efficacious techniques include the derive, which originates in French surrealist philosophy (pp. 77-84), and the process described by Dunn to enter otherworldly space in order to deposit a defixio by using the derive to make the familiar unfamiliar is intriguing and quite accessible and potentially productive in its implications. Rituals occur in the physical world, but bridge that physical world with the highest level of abstractions: the stories that organize our metaphors themselves. Language does not begin with the word, but with the story, and magic does not begin with spirits and gods, but with the physical world. Even the so-called highest form of magic, theurgy or the invocation of deities, operates ultimately among the symbols of the physical world, manipulating them to re-create the myths where the gods dwell. He ends this chapter a few pages later, after a section focusing on theurgy, and concludes “We can change the story, talk back to matter, through myth” (p. 197). Again, relocating the most high-flown concepts in magic that would seem to most heavily favor the body/spirit dualism so endemic within much of religious culture worldwide in the physical realm, and in particular in the form of very physical and sensual words and language, is a revolutionary and liberating concept. There are a few cases in the book in which I would argue that there is some missing terminology, which would have advanced (or, at very least, enhanced) the argument at certain stages. The discussion of phatic communications (use of language to connect, rather than to convey information) amidst the discussion of glossolalia and barbarous words (pp. 114-115) would have benefited greatly from a discussion of the two types of mysticism often encountered in religious studies scholarship, namely apophatic and kataphatic practice, with the former not relying on words and images, and the latter using words and images, in their attempts to connect with ineffable spiritual realities. The discussion of narrative precedent and its use as part of spell incantations (p. 59) would have been substantially enhanced by use of the term historiola (plural historiolae), the term currently used in academic studies of magic for such narratives, attached to spells as prefaces, or within the performative texts of spells themselves, which not only draw upon established myths and narratives, but often vary them considerably, or create them freely — and considering the later discussion of “talking back to matter through myth,” use of historiolae in this fashion as part of magical operations would have been increasingly useful. There are a few mistakes of a substantial nature (apart from the occasional forgotten word or misspelling that evaded proofreading) which need to be pointed out. On p. 25, the Welsh /ll/ sound is said to be Gaelic; it is in fact Brythonic or British, and while both the Brythonic/British and Goidelic/Gaelic languages are in the Celtic linguistic group, the two are fundamentally different and not interchangeable. Likewise, on p. 101, various Indo-European linguistic groups are listed, and Gaelic is given as one of them; Scottish and Irish (as well as Manx, which isn’t included) are indeed some of the Gaelic languages, but “Celtic” would have been a more appropriate grouping to list alongside Germanic, et cetera. The diaspora of the Indo-European languages is said on pp. 57 and 101 to have taken place about ten thousand years ago, whereas most Indo-European linguists put it more in the 2500-2000 BCE range, so only about 4500 years ago at most. On pp. 103-104, Austin Osman Spare’s “alphabet of desire” is discussed, and while the concept did originate with Spare, the terminology itself comes from Kenneth Grant’s 1974 introduction to Spare’s Book of Pleasure. Victor Turner’s discussion of the ritual process is mentioned on p. 187, but the actual concepts involved originate with Arnold Van Gennep’s work Rites of Passage, upon which Turner drew. It is disappointing that, despite having full citations in the footnotes found throughout the book, page numbers are usually not given for the origins of particular passages in books. The continuous footnote numbering throughout the book is also a bit cumbersome, but very likely was not the author’s preference. AsLlewellyn (hopefully!) produces more books with meticulous footnotes, perhaps these latter two matters will begin to sort themselves out more systematically. I would recommend this book without reservation to anyone interested in a more linguistically aware, verbally efficient, and theoretically grounded approach to magic, ritual texts, and performative speech acts. 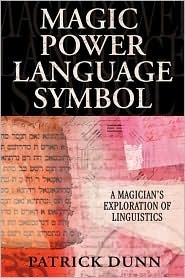 There truly is magic and power in words, and we ignore this fact as magical practitioners and ritualists at our utmost peril; judicious application of this book’s ideas will dramatically improve anyone’s practice which does rely on, and deeply understands and engages with, the amazing possibilities inherent in language.